We've been swimming again lately. The weather's finally warm enough and we feel like we need to swim with some friends and enjoy our pool before we leave it. The new pool is pretty, but not nearly as big, deep, or with a nice jumping area. 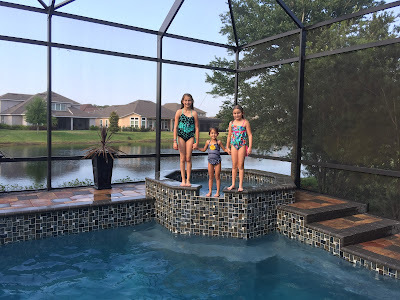 The kids have fun jumping from the spa in to the deep end in our pool and we're definitely going to miss that feature when we move. We meant to take a picture when Rachel and Anna's kids were over, but forgot. I snapped a pic of Paige before she jumped in the pool with Julia and Megan, and I took a couple short videos of them all swimming and playing.